I used to have this crazy idea that it was my job to save the world. Improving the world is so much more reasonable, because we can all do something right now to improve our little corner of the world. It can start with changing our thoughts or cleaning up our own mess. Great post! We can save the world one person at a time. Beautiful and true. 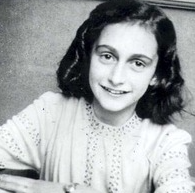 And awesome to think of Ann Frank’s legacy when she died so young.